This is a "must have" utility for the power keyboard user. It provides the often requested facility to be able to switch easily and cleanly to the Windows Explorer desktop. With Windows Vista and Windows 7 there was no requirement for Tab2Desk because these versions of Windows had the facility built-in with their default Alt+Tab switcher. However, with Windows 8 and later, the facility hasn't been included so we've now revised Tab2Desk to work under Windows 10. Simple to use - just run the executable. Thereafter, when you use the Windows Alt+Tab keystroke you'll have an item that says either "Mimimize All Windows" or "Restore Windows to Desktop" depending on whether you have any visible windows or not. Once you've run Tab2Desk, press Alt+Tab. Follow the link to a registry settings file that will change your settings to classic Alt+Tab mode after logging off/on. Once you've downloaded the Tab2Desk zip file, open it and store the Tab2Desk.exe somewhere on your computer - such as in a folder you create (e.g. C:\Tab2Desk). An easy way of doing this is to add a shortcut to Tab2Desk to your Start-up folder. 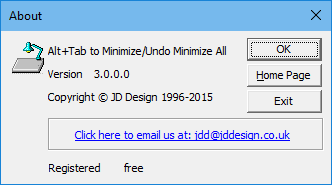 In the Create Shortcut dialog, use the Browse button to navigate to, and select the Tab2Desk.exe program from wherever you've saved it on your computer. Complete the shortcut creation dialogs and Tab2Desk should now start whenever you log onto your computer. 1. 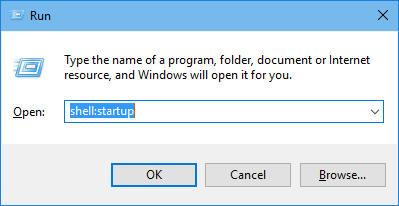 If you start a second instance of Tab2Desk (by double clicking the shortcut in the startup folder for example), it'll pop-up the following dialog that allows you to close it with the Exit button. 2. Use the Task Manager End task command on "Alt+Tab to Mimimize/Undo Minimize All". Since Tab2Desk doesn't store anything on your computer, even forcibly killing it with Task Manager is safe.